Many design patterns exist to deploy your network with AWS Transit Gateway Orchestrator. Here are some examples. 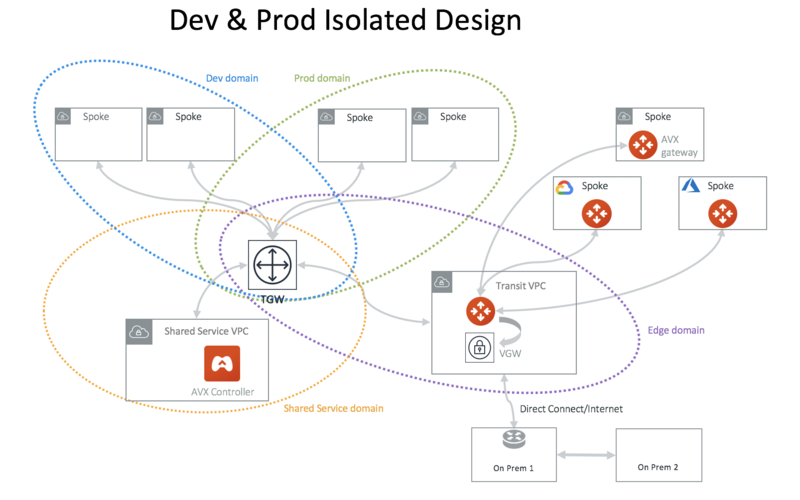 If you like to build network segmentation between Dev/QA VPCs and Production VPCs, but requiring shared service VPC and on-prem to reach each VPC, consider the diagram below. diagram below. In this network design, you need to create a two custom Security Domains, Dev_Domain and Prod_Domain. At the Plan page Step 2, select “Create Custom Security Domain” and fill in the information. Make sure you multi select Shared_Service_Domain and Aviatrix_Edge_Domain for “Connect to Security Domains”. Apply this step for both Dev_Domain and Prod_Domain. 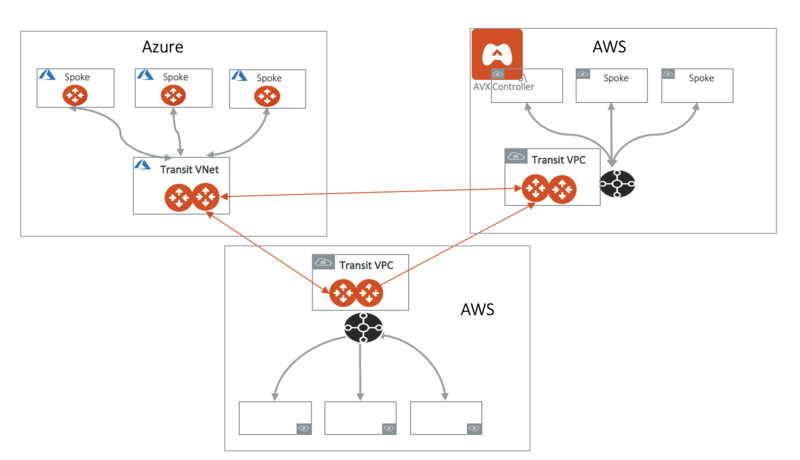 If you are only concerned about VPC to VPC segmentation, you can deploy Aviatrix Controller for an all-in-cloud segmented network, as shown below. 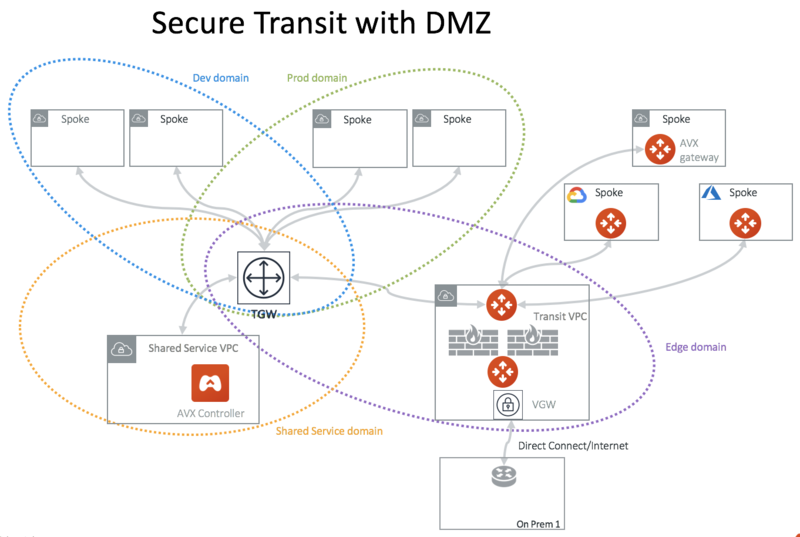 You can use Aviatrix Transit GWs to connect AWS Transit Gateways in multi regions and multi cloud deployment, as shown below. 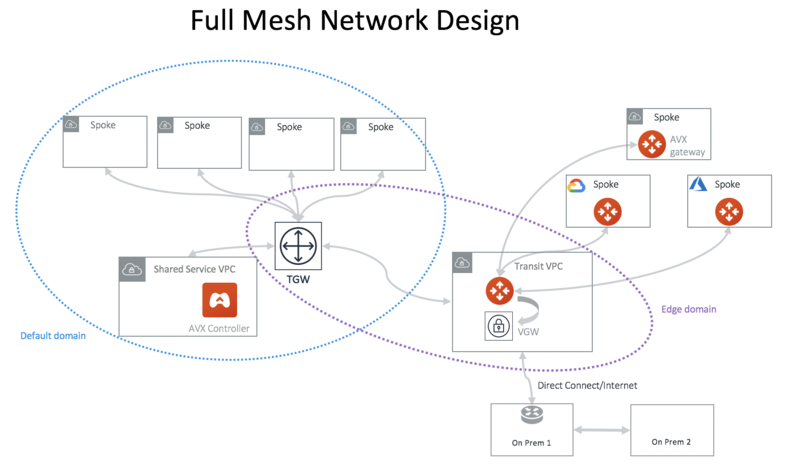 If you like to build a full mesh network that allows all VPCs and on-prem to communicate with each other, you do not need to create any custom Security Domains. Simply use the built-in Default_Domain and Aviatrix_Edge_Domain for the deployment, as shown below. At Plan page Step 2, select “Full mesh network”. 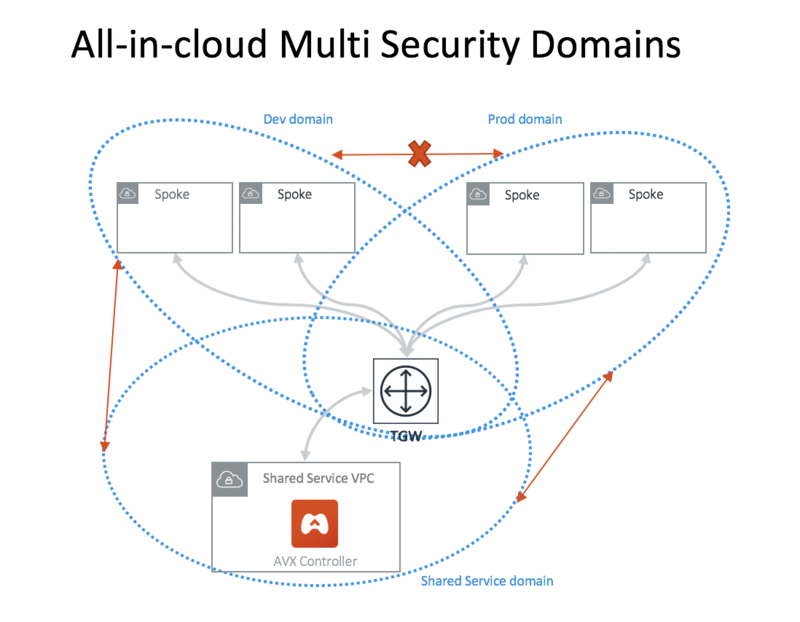 If you like to build a fully isolated network where no VPC can communicate with each other except to the shared service VPC and on-prem, you need to create a Security Domain for each VPC and connect each domain to the Shared_Service_Domain. 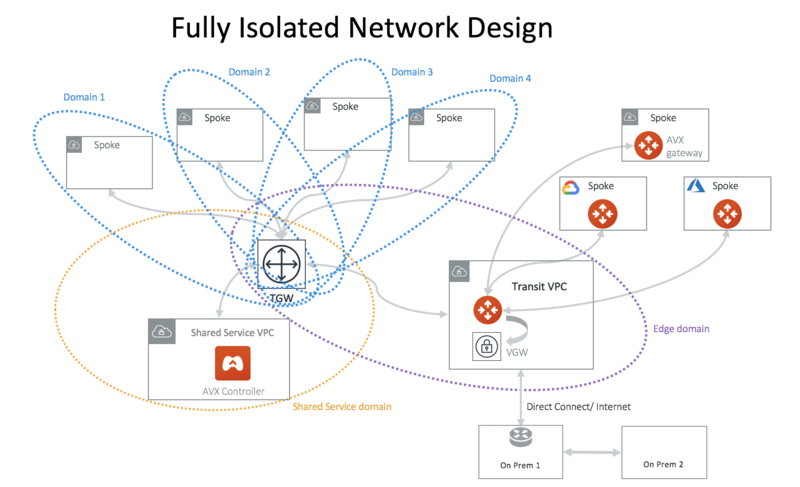 In this network design, you need to create a custom Security Domain for each VPC. At the Plan page Step 2, select “Create Custom Security Domain” and fill in the information. Make sure you multi select Shared_Service_Domain and Aviatrix_Edge_Domain for “Connect to Security Domains”. Repeat this step for each VPC. If this design does not scale for you, consider Aviatrix Transit Network workflow where all VPCs are by default isolated to each other. 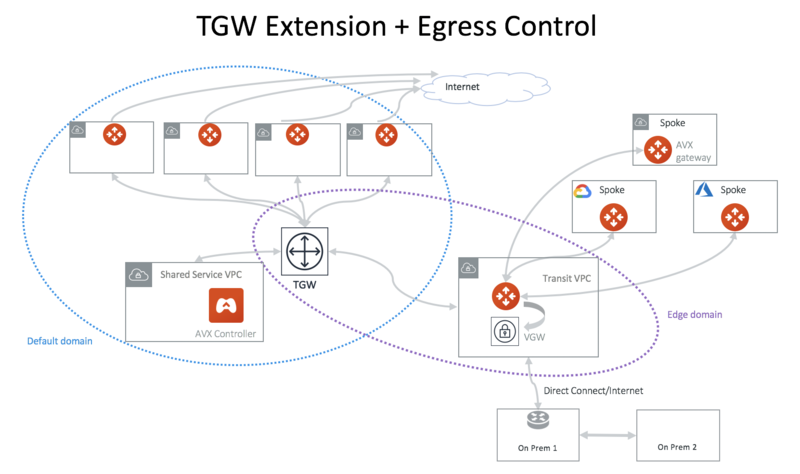 For any of the TGW design patterns, you may deploy Aviatrix distributed Egress FQDN in each VPC. In this example, a full mesh deployment is expanded to include Egress FQDN support, as shown below. Follow the instructions for FQDN to deploy egress control funct ion. 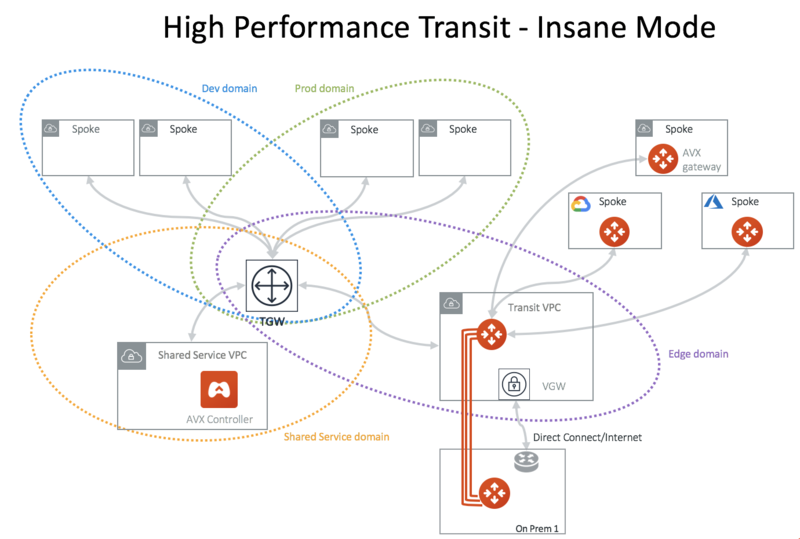 Deploy an Aviatrix hardware appliance on-prem to achieve 10Gbps Transit Network throughput. Added benefit is that traffic over Direct Connect is encrypted. Firewalls can be deployed in the Transit VPC for a centralized Ingress and Egress security solution, as shown below. .